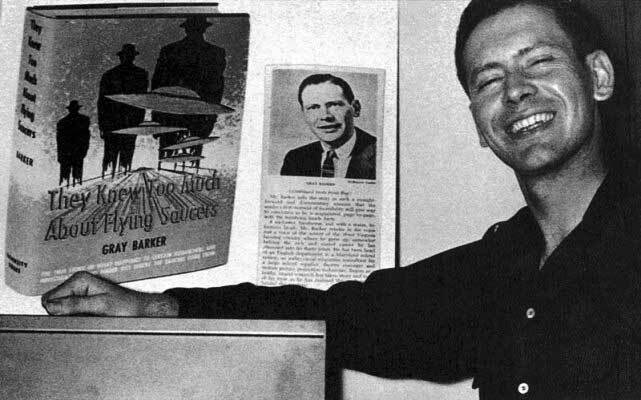 Gray Barker born May 2, 1925, was an American writer best known for his books about UFOs and other paranormal events. Barker's 1956 book They Knew Too Much About Flying Saucers introduced the Men in Black to UFO folklore. Skeptical about UFO claims Barker mainly wrote for financial gain. He was also known to create hoaxes to deceive UFO investigators. In 1952, Barker worked as a theater Booker in Clarksburg, West Virginia. There he began collecting stories about the Flatwoods Monster, a extraterrestrial creature seen by some children in Braxton County, West Virginia. Barker submitted an article about the Flatwoods Monster to FATE Magazine, and shortly after wards began writing regular articles about UFOs for Space Review, a magazine published by Albert K. Bender's International Flying Saucer Bureau. In 1953, Albert K. Bender abruptly dissolved the International Flying Saucer Bureau, claiming that he could not continue writing about UFOs because of "orders from a higher source". After pressing Bender for more details, Barker wrote his first book, They Knew Too Much About Flying Saucers, which was published by University Books in 1956. Barker's book was the first to detail the Men in Black, a group of mysterious figures who intimidate eye witnesses into keeping silent about UFOs sightings. Barker recounted Bender's own encounters with the Men in Black, said to travel in groups of three, wear black suits, and drive black cars. In 1962, Barker and Bender collaborated on a second book on the topic, called Flying Saucers and the Three Men. In this new book they proposed that the Men in Black were extraterrestrials. Over the next two decades, Barker continued writing books about UFOs and other paranormal events. One of these was 1970's The Silver Bridge, which linked the collapse of the Silver Bridge, on December 15th, 1967 in Point Pleasant, West Virginia with the appearance of an alleged paranormal creature known as Mothman. Barker's Silver Bridge preceded John Keel's The Mothman Prophecies by five years. Before dying on December 6, 1984, Barker wrote a final book about the Men in Black, called MIB: The Secret Terror Among Us.